We offer high quality rapid prototyping services for manufacturing, design engineering firms with competitive rates. We are one of the fast growing rapid prototyping companies in India with more than 20 years of experience. We can turn your ideas, concepts into 3D CAD models with our rapid prototyping services. 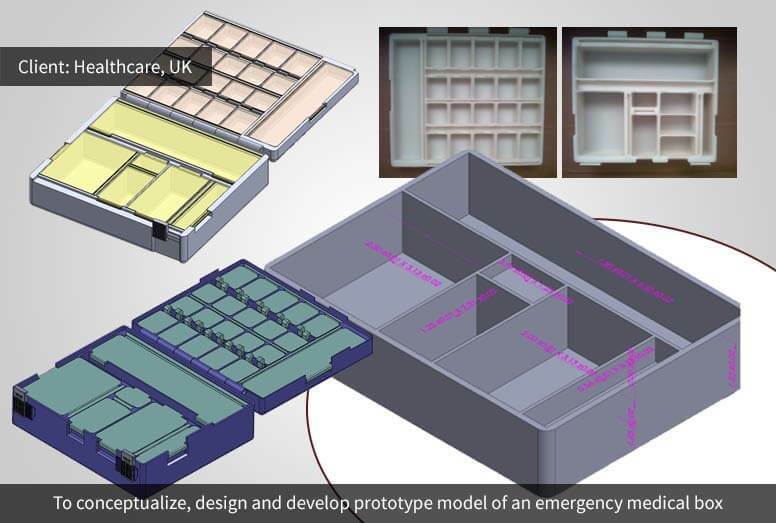 We work with an integrated design approach of product development ensuring fast & realistic prototype models avoiding common mistakes and pitfalls. Our mechanical engineers have deep expertise in CAD modeling for rapid prototyping with de-featuring, geometry healing and associated skill sets. We deliver CAD models that are suitable for design verification through simulation in CAD environment. We also specialize in metal prototyping, mechanical prototyping, automotive parts prototyping & plastic prototyping services. Our CAD design teams are dedicated to deliver high-quality 3D CAD models to suite the various prototyping requirements. We follow advanced prototyping methods & process. Outsource your 3D rapid prototyping projects to us and we will turn your ideas with high quality, accurate 3D prototypes.